Thanks to the Toys N Bricks site, we now have a pretty official date for the official grand opening of the LEGO Store at Fashion Place Mall. The festivities will be on October 4th, 5th and 6th, which is Friday through Sunday. Clicking on the link above with take you to their site, which has scanned photos of the LEGO October 2013 calendar of events. 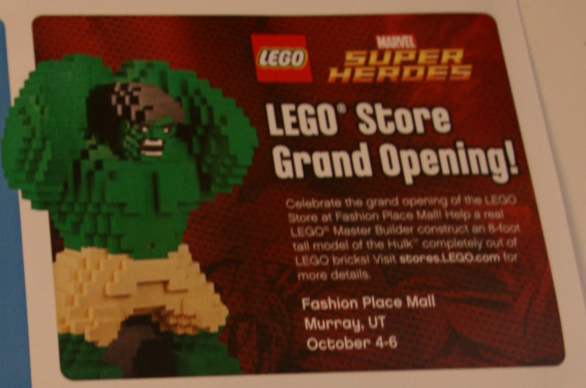 Sure, there’s other events going on at other LEGO stores… but the one we care about for now is the Utah store grand opening announcement. Except for maybe double VIP points for VIP members during the month of October. That’s kind of important and related to an October grand opening. Which leaves the rumored date of September 20th as a possible soft opening, which would prepare the staff of the new LEGO store to gear up for the official grand opening date. Once again thanks to Rob for his comment on the last LEGO Store Update with this new information. It’s now officially official. Or… something like that. According to the LEGO web site. Thank you for the link. I got my LEGO catalog the other day and it mentioned the dates, but not any of the details of the events during grand opening weekend. A new update has been posted with details from the above link.